Eva Jablonka and Marion Lamb identify in their book Evolution in Four Dimensions: Genetic, Epigenetic, Behavioral, and Symbolic Variation in the History of Life four “dimensions” in evolution – four inheritance systems that play a role in evolution. 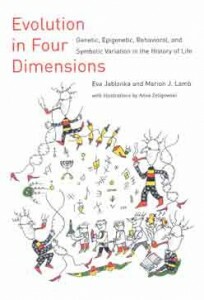 These four dimensons are: genetic, epigenetic (or non-DNA cellular transmission of traits), behavioral, and memetic or symbolic (transmission through language and other forms of symbolic communication). Interesting viewpoint. In general, any inheritance system that provides variations on which natural selection acts can be considered as an evolutionary system.